DigitalOcean is the fastest growing cloud infrastructure provider built for developers. With state-of-the-art data centers around the world, DigitalOcean is laser-focused on its mission to simplify infrastructure for development teams. Visit DigitalOcean.com/twist and get $10 credit to spin up a server in 55 seconds! It’s no secret that entrepreneurs everywhere are feeling the effects of the constricting tunnel of capital flow. Filmed on the LAUNCH Stage at the 2016 LAUNCH Festival, Episode 635 of This Week in Startups features an all-star VC panel with Jed Katz of Javelin Venture Partners, Aileen Lee of Cowboy Ventures, and Hunter Walk of Homebrew. Jason doesn’t shy away from asking the tough questions to get a glimpse into the minds of these seasoned VCs, find out what they’re looking for, and where they’re placing their bets. Then Kirt McMaster of Cyanogen, the largest distribution of Android on Earth, joins Jason for a fireside chat on the LAUNCH Stage. Kirt gives an in-depth look at his groundbreaking company and the future post-app ecosystem with CyanogenMod. M&A has lost some traction recently. The panel discusses the trend that we are seeing with a lack of merger & acquisition by the major tech companies, i.e. Google, Microsoft, and Facebook. Jed thinks it’s a trend that goes in waves, that often large companies focus so intently on bigger projects that they move away from the smaller investments, and then revert back to founders when the time is right. Hunter sees Microsoft as the most likely success for acquiring startups, given their track record with companies like Sunrise, Outlook, and Wunderlist. Take your time, get to know your investor. The VCs are hoping to see a change in the mindset of entrepreneurs, the mindset that they need to rush into closing with whoever is willing to hand over investment money. It’s important for Hunter to get to know the founder first, and is repelled from investing under pressure. The panel is in agreement across the board that this sort of “demo day” culture is toxic for entrepreneurs, and that while they should be encouraged to close deals, they should be more careful about which investors they are getting involved with. What is Cyanogen, and how is it changing app development? Cyanogen, a custom OS built on Android, began as an open source project in 2009. Many applications such as incognito mode, swipe to remove notifications, and certain privacy guard features were all developed on the Cyanogen operating system 18 to 24 months prior to Google or Apple picking up on the trends. Kirt believes that the next great computing platform will be developed on Android. This led Cyanogen to their new platform: Mod, which enables deeper integrations within Android that are simply impossible on any other operating system. How does Google really feel about Cyanogen? Jason asks about Google’s true intentions behind setting up their CTS (compatibility test sweep), specifically whether or not they are trying to keep competitors out of their market. Seven of the top ten apps on Android are Google services, so of course they want to hold onto that kind of control. However, Kirt believes that with an anticipated Android user base of 4.6 billion by 2020, Google has no choice but to open up the platform for third party systems like Cyanogen. Now, let’s see these Mods in action! The post-app world of Mod is a compelling thought, one that savvy developers simply can’t ignore. So, let’s see some of these Mods in action! Kirt shows off a few of his favorite features built with Cyanogen. For instance, they’ve enabled Cortana to take a selfie or play music from Spotify, simply by asking her to do so… fully hands free! They’ve also integrated a Mod into Android, where you can seamlessly connect to Skype directly from a mobile call. 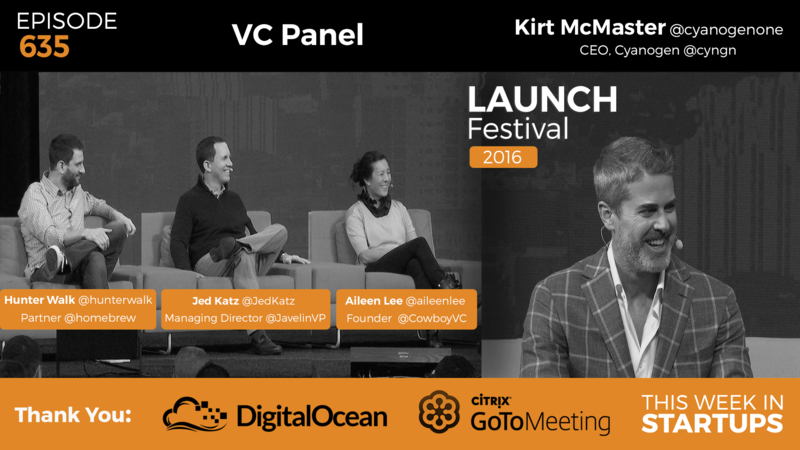 1:37-2:17: Jason kicks of the 2016 LAUNCH Festival with an introduction to the first VC panel. 2:17-3:50: Jason asks about the “choppy waters” we’ve been stuck in over the past six months. 3:50-4:29: Jed predicts that his firm will likely spend more money on the companies that they invest in over the next year. 4:29-5:34: Hunter explains why his firm makes the same number of investments regardless of whether the market is up or down. 5:34-6:55: Aileen is telling her portfolio companies to watch their burn and take extra time to focus on the mission and culture. 6:55-8:13: Jed points out that a lot of companies who raised early are glad they did now. Hunter thinks that some companies should be turning on the heat rather than slowing down. 8:13-12:42: Aileen thinks that exit strategies are going to need to change in the coming years, especially in the consumer space. 12:42-14:02: Why is it that some of the strongest companies entered the market during a down cycle? 14:02-16:37: M&A has slowed recently, but Hunter thinks that Microsoft has been doing a pretty decent job of acquiring quality startups. 16:37-22:00: The panel addresses the rocky situation at Zenefits, and the lessons we can learn from it. 22:00-28:07: The VCs are all in agreement about the toxicity of the high pressure demo day strategy that founders have recently gravitated toward. 30:00-33:19: Jason asks Hunter about his thoughts on the encryption controversy with Apple. The conversation naturally leads to politics and their favorite candidates. 33:19-37:37: Jason introduces Kirt McMaster, CEO of Cyanogen. Kirt gives us an introduction to his innovative company. 37:37-42:39: Jason and Kirt debate the true meaning behind Google’s use of CTS (compatibility test sweep). 42:39-47:35: Kirt demos some of his favorite new mods built on Cyanogen. 47:35-49:38: Jason and Kirt discuss Microsoft’s relationship with Cyanogen. 49:38-51:30: Kirt explains the mission of Cyanogen, and the opportunities that users will have with this new operating system that they won’t have on any other. 51:30-54:37: The conversation turns toward security and privacy, specifically whether Apple should build a backdoor for the FBI. 54:37-57:33: Kirt explains the biggest difference between Mods and apps. Then, Jason asks what Google really thinks about Cyanogen.